“The Manchurian Dinner Date” sets up an explosive confrontation between Eddie and Jessica, only to resolve their conflict with a satisfied sigh. To the writers’ credit, it’s an unexpected move when considering the forcefulness of Jessica’s personality. She spends the entire episode gushing over Eddie’s (fake) girlfriend, so when he reveals that Alison’s not an orange-toting Chinese girl whose real name is Audrey, but the white piccolo player onstage, we’re meant to think that Jessica’s going to blow up or at least intensify everything around her with one of her laser-focused glares. But she doesn’t. Instead, she accepts Eddie’s choice in a partner and admits that she’s quickly grown bored with how traditionally perfect Audrey is. To everyone’s surprise, she ends up liking Alison, who she praises for being Chinese in her heart, if not in her actual background. As off-color as that remark is, it’s just about the best compliment you could expect from Jessica. On the downside, however, the tender moment between mother and son also exemplifies how static “The Manchurian Dinner Date” feels as an episode, largely because Eddie spends most of it being reactive instead of proactive. He has zero agency in the central scheme of switching out Alison with Audrey to impress Jessica, and even when he makes several attempts to correct the situation, it’s done with resignation. He’s more or less just going with the flow. Does “The Manchurian Dinner Date” need him to run around like a maniac or have a loud freakout on his mom in the middle of the graduation ceremony? Of course not. But because he responds to everything with the same slightly bewildered stare—a stare that never wrenches itself into full-on panic mode due to the relaxed nature of the ending—the episode has almost no stakes. While the story’s unexpected resolution is something to be admired on network television, Eddie’s girlfriend meeting his mother for the first time is a watershed moment in his life, just like it’s a watershed moment in any young person’s life. Despite this, the episode takes on a decidedly one-note tone, preventing us from ever getting a palpable sense of the pressure, neuroses, and flat-out fear that usually accompany such an event. There’s also the issue of the relationship itself. As Alison, Isabella Alexander has always found both a kindness and a toughness that make her more likable than Nicole, but the episodes centered around her and Eddie have been some of the weakest of the season. That’s more on the writers than the performers, as their scripts often give the young actors little to do. We know the characters like each other because we’re told they like each other, but we don’t know a ton about what Eddie and Alison are like as a couple. Even if that reflects the bashfulness of real-life adolescent romances (middle-schoolers seem to talk to each other less when they’re “dating”), it doesn’t make for especially captivating television. At the very least, the warmth shown by Jessica towards their relationship extends to the two subplots of the episode, both of which involve a parental figure helping out a child. As Emery gears up for graduation, Louis shows him how to add flair to his valedictorian speech—advice that Emery eventually rejects in favor of talking about how much he loves his family. Elsewhere, Granny Huang assists Evan in creating the perfect suit for the evening. He gets his own show-stopping moment when he struts into the post-graduation dinner at Cattleman’s Ranch in his miniature three-piece, complete with his name sequined onto the back of the jacket. Like the exchange between Eddie and Jessica at the ceremony, both of these storylines are sweet, if minor. 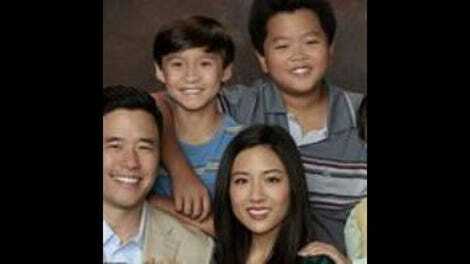 But Fresh Off The Boat’s a sitcom that’s proven time and time again that it has the ability to be both sweet and major. And if “The Manchurian Dinner Date” had shown a little more variety—specifically in how Eddie deals with the problems surrounding him—perhaps his dilemma would have felt more dire, which would in turn make the conclusion more satisfying. Malcolm X on VHS really was that enormous. You could kill someone with that thing with just a couple hits. Would “The Manchurian Dinner Date” pass the Bechdel Test? Eddie’s obviously the center of the events, but I can’t remember if Jessica actually talks about him with Audrey or Alison. Did anyone else feel bad for that second, more boneheaded valedictorian? I loved how she confused the microphone with the light. “Don’t get sick” reads the marquee in front of the school. Sage advice!